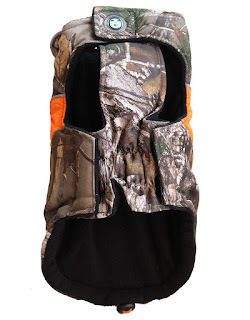 It does not look like it yet but winter is coming ... And when it does, the new Huskimo Realtree Sherpa Dog Coat will deliver not only effortless style but real protection for your dog during those walks on cold and windy days. We can't wait! We certainly now understand what top models have to endure when shooting the latest fashion six months in advance! Aramis, our resident model had to get up very early to avoid overheating on location, as temperatures still reached the mid-30s that day. What are the main features of the Realtree Sherpa Coat? 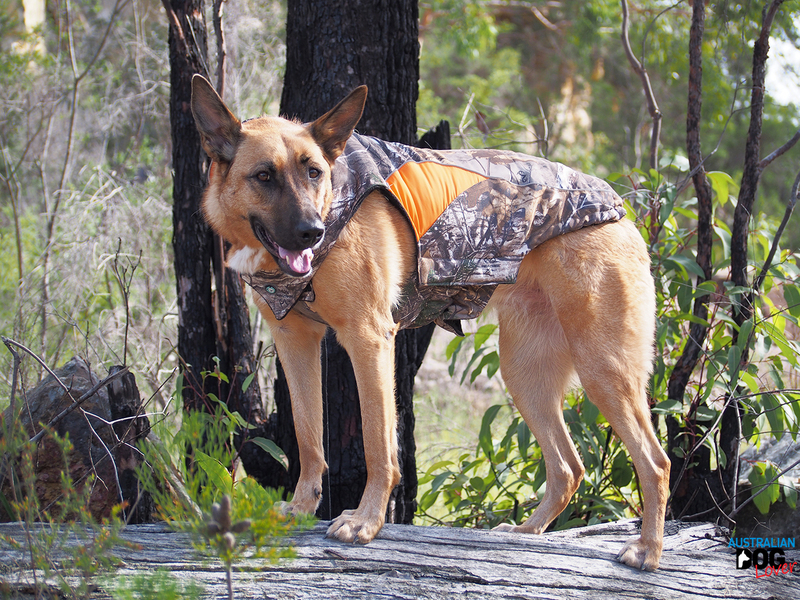 The new Realtree Sherpa Dog Coat from Australian designer brand Huskimo shares a lot of features with the previous Sherpa model we reviewed last year. The most striking feature to catch our eye was by far the camouflage fabric being used, aptly named Realtree and sourced in the US. If you’ve ever visited a fishing or camping outlet store in the USA, this fabric is commonly used in fishing and hunting gear and with good reason as it blends seamlessly in the landscape. It seems to work just a well in our Australian bush setting as it would in the Alaskan wilderness! 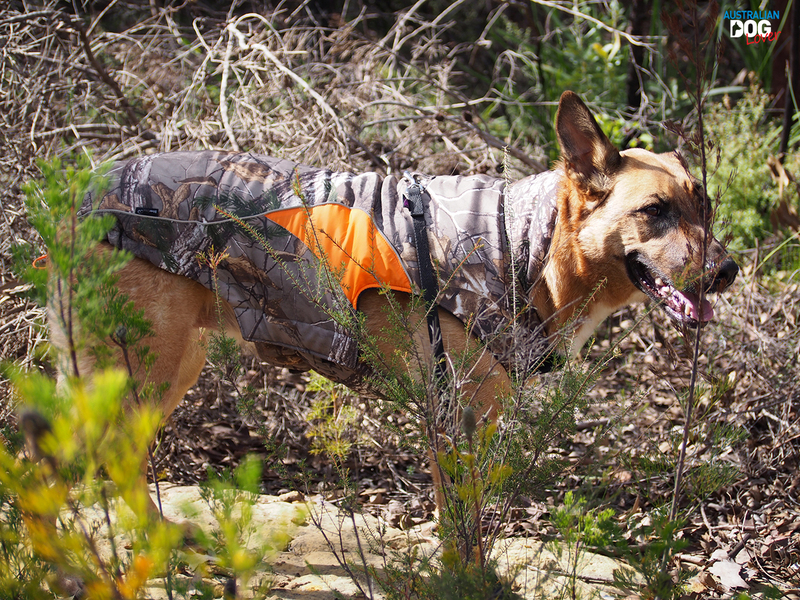 Since our dogs are unlikely to go hunting for their own dinner in the wild, this detail matters less than the wind and rain protection delivered by the Realtree fabric. So when our weather suddenly turns to Autumn, we will be ready to battle whatever the elements decide to throw at us and perform an actual watertightness test! We don’t usually suffer much from the cold on the Eastern seaboard but every winter, we will experience a handful of mornings where the frost may bite and sensible dogs like ours would happily pass on an early morning walk. 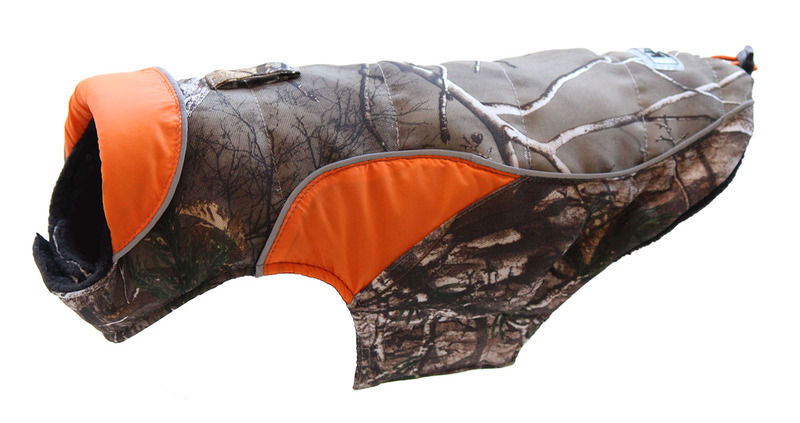 Luckily the Realtree Sherpa Dog Coat comes with a sub-zero microfleece lining (black) which does feel very warm and soft to the touch but this new material is also lighter and more breathable. This is essential for our longer walk in winter as we know our dogs will warm up eventually and we don’t want them to end up feeling damp and uncomfortable. 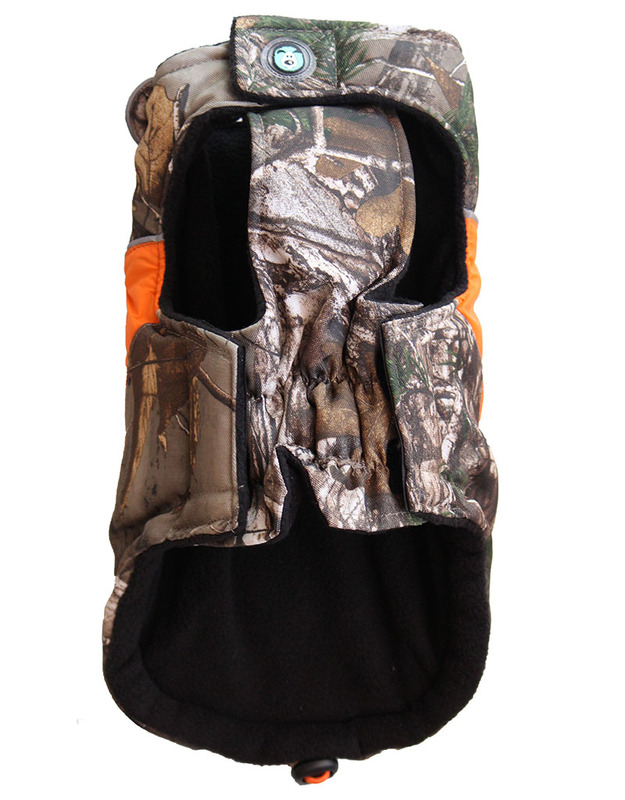 As with all other Huskimo coat designs, the RealTree Sherpa dog comes with a patented Silver Clear Odour Protection, this ensures the coat is hypoallergenic as it stops the growth of germs and kills bacteria. We prefer walking our dogs using a dog harness so if we’re going to fit a dog coat on top of it, we still need to be able to clip our leash somewhere. 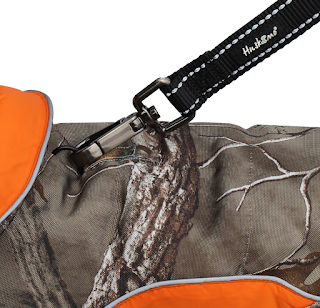 The Realtree Sherpa Dog Coat features a Reinforced Leash Hole so we could easily clip our lead to the D-Ring on our harness as usual. The outside seams are reflective to keep your dogs visible and safe which is important when you’re crossing a street in low visibility conditions or at night. However if you walk your dog regularly very early in the morning or at night, you could clip on the Huskimo® LED Light on the Light Loop, placed on the top of coat for that purpose. The Huskimo® LED Light (green, blue or red) provides visibility up to 800m and you can also select from three light speeds with just one touch. If your dog has a particular fondness for puddles or you get caught in the rain, it is also water-resistant (though not waterproof). A lot of attention to details has gone into the design of this dog coat to ensure it stays on despite your dog's acrobatics! An underside panel ensures you can fit both the left and right hand side panels using Velcro straps to suit your dog's girth - this made us realise we need to step up our walking routine, sorry Aramis! - to the toggle at the tail end which enables more of a snug fit when you have a slim built dog. We're now set for more "Barkour" (dog parkour) experiences! 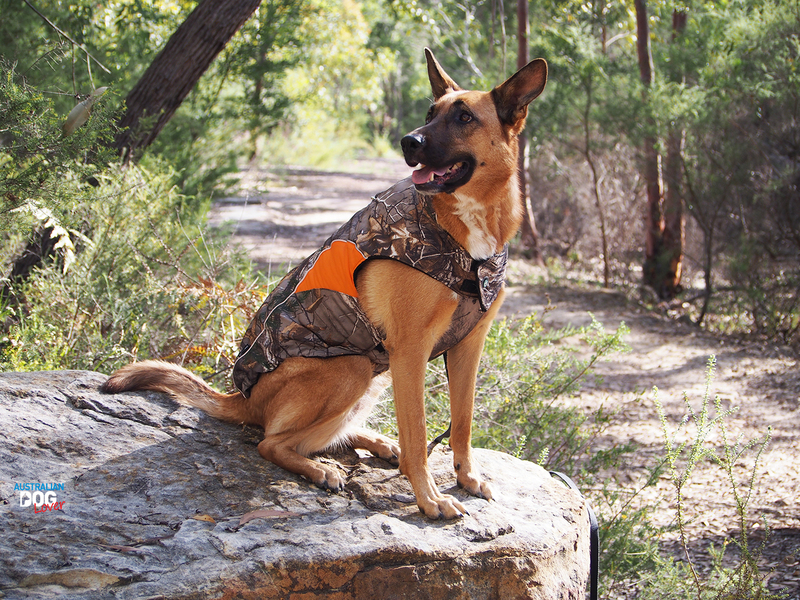 The RealTree Sherpa Dog Coat is available in 7 sizes: from 33cm up to 73cm in length. For our Belgian Malinois (around 30kg), we selected the 67cm length and it was long enough. 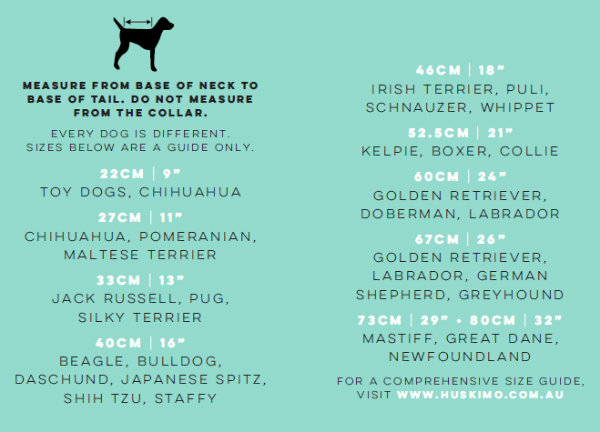 To ensure you order the perfect size for your dog, you should measure from the base of the neck where it meets the body, to the base of the tail where it meets the body. The enclosed size guide may be of assistance if you don't have the option to try the coat with your dog in-store. RRP: $47.95 - $74.95 from Best Friends Pets and all good independent pet stores. Huskimo is a relatively new Australian designer brand of pet apparel and dog accessories, launched in 2014. The brand finds its inspiration in our spectacular wide open spaces and our love of sharing the great outdoors with our canine friends. Their motto is "Original - Innovative - Striking - Honest" and these values underpin the collections that have been released so far. 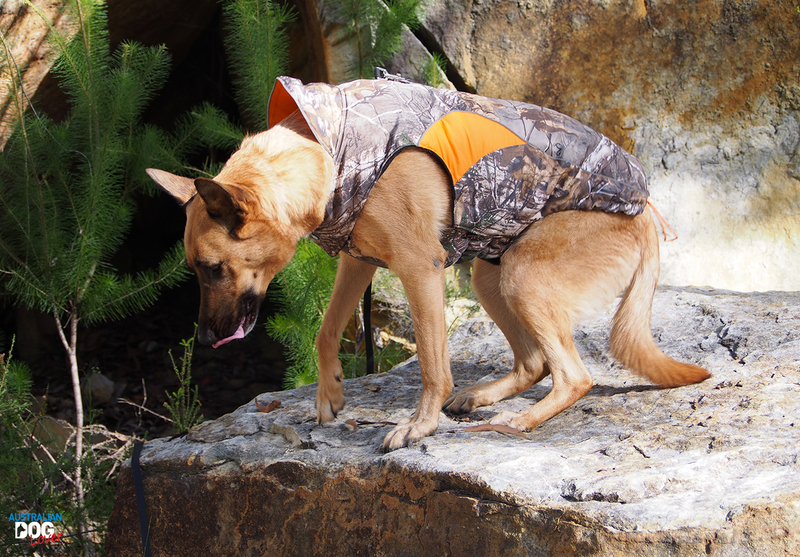 Disclaimer: Realtree Sherpa Dog Coat provided by Huskimo for our editorial consideration.